This hidden land is definitely like no other place you have been before. Many of you have visited vineyards. Many of you have enjoyed wine-tastings. If you’re really lucky, some of you have helped make the wine. But how would you like to own the whole vineyard, at least for a day or two? 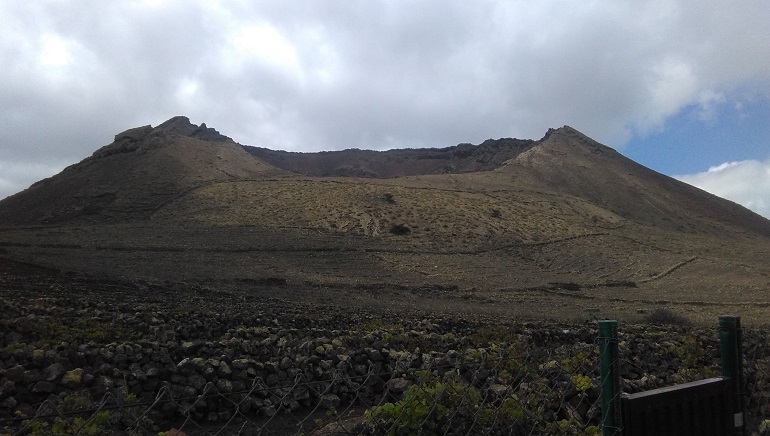 And how would you like that vineyard placed under the shadow of a volcanic crater? And how would you like the ranch house in which you, your finest friends and your loved ones sleep to be placed on the vineyards of one of the most beautiful landscapes in the world bar none, pick the grapes, make the wine, drink it in your bodega, and take it home with you? Well, it sounds over the top, but it’s also true: it is possible to jet out to the mind-blowing landscapes of the Canaries’ most mysterious and uninhabited island and have the cleanest vineyards in the world to your name, as your cups runneth over for as long as you choose to stay. 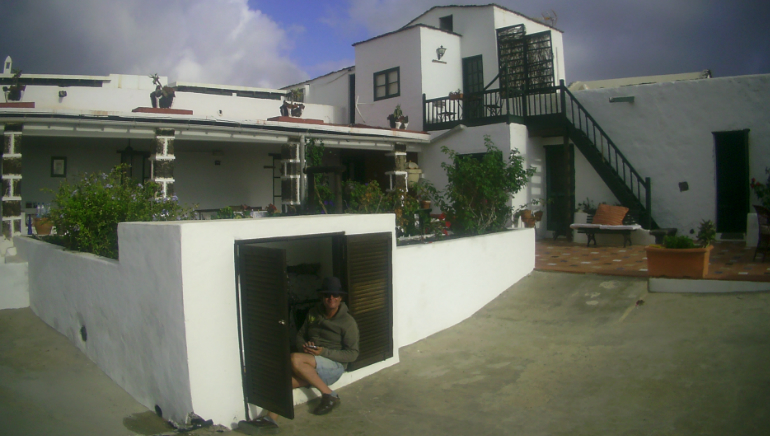 La Torrecilla is a 6 BR, two and a half bath 150-year-old Riyad-style ranch house sitting on the farthest Northern tip of the Canary Isles, in the tiny remote village of Ye, on land owned for over 800 years by one of the original noble families of Lanzarote’s mystic North Coast. When you get hungry, you can either barbecue in the yard, or walk around the corner to the steakhouse to banquet on some of the cleanest, juiciest cuts you will ever see on a plate, prepared on an open grill right before your eyes at La Corona de Volcano, nestled in the volcanic shadow of one of Lanzarote’s prime natural attractions. 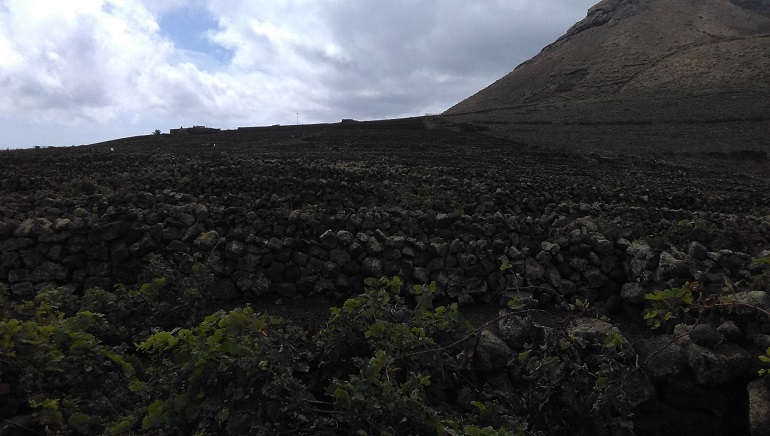 In addition to drinking the cleanest, sweetest virgin wine, the best sites in Lanzarote are all within walking range. This includes the Jameos del Agua, Mirador Del Rio, Cueva de los Verdes, Volcan de La Corona, and the port of Orzola where you can take a boatride to view the cliffs of Farmara and the isleta of La Graciosa. Emilio has his own list of local favourite sites, most reachable by foot. They include the volcan las cemadas, also known as the “small Machu Pichu”; le cueva de la livreria; el castillo de phantasme, the local ghost castle; playa de caleton blanco, Emilio’s pick for Lanzarote’s real "best beach”; charcos de la condesa, the wondrous natural pools of Northern Lanzarote; playa de las cocineitas, a beach in Lanzarote’s wildest coastal region, dangerous for swimming but great for a sun bath in the ample standing water area complete with a magical waterfall; the playa salvaje de orzalo, whose natural stalagtites are visible when the tide is low for an hour and a half or so; and sendero de los gracioceros, a hidden mountain 400 meter descent to a small, deserted beach in front of Isleta La Graciosa, the site of the old salinas, or salt factory. 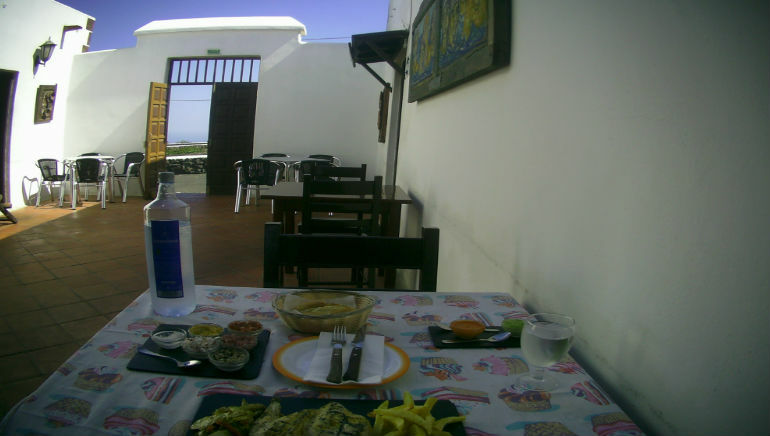 As for the typical touring package of the area, the Mirador del Rio is the famous viewpoint offering the best views of Lanzarote’s spectacular northern coast and horizon; the Jardin de Cactus, or Cactus Garden, houses legendary artist César Manrique’s last landscape monument along with cactus specimens from all over the world; and Los Jameos del Agua is the fantastic underground lake located inside the volcanic tunnel created by the eruption of La Corona Vulcano, housed within Cueva de los Verdes, the 3000-year-old tube cave formed by lava flows from Mount Corona. Emilio is sharing the wonders of the Courvello family land with the world not only through the vineyards, ranchhouse, and uninhabited hills of the natural volcanic Parque de La Corona in which the family’s massive swath of land lies, but through the fully naturally powered Ecolodge farmhouse. Budget friendly accommodations for families, solo travellers and couples are all available at El Cortijo (“The Hobbit”). Equipped with a diverse range of 15 comfy, homey single unit dwellings all complete with private baths, this eco-finca is powered exclusively by windmills, solar panels, and air tanks, with the water collected from stone walls hundreds of years old that catch the moisture from the air. The hidden land and history of this place makes every new day a mind-blowing adventure, and Emilio offers accommodations with an astonishingly convenient and rare level of proximity to all. Where most positive reviews rightfully come off as hyperbole, this is a situation of the diametric opposite: there are truly no words to do justice to the magical, fully preserved wonders of northern Lanzarote. 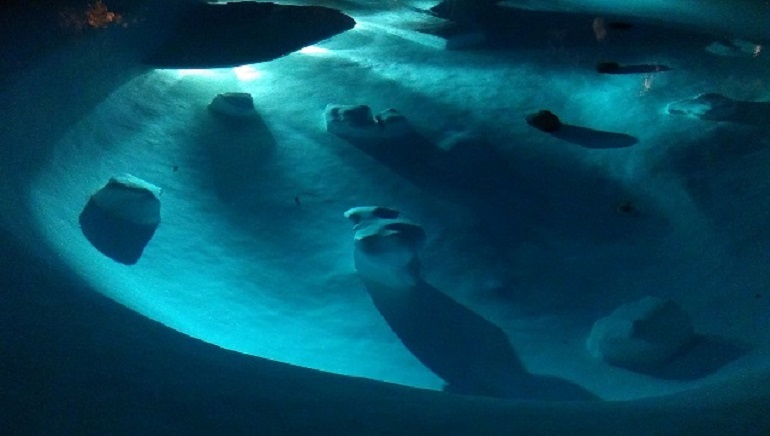 Saturday at Jameos del Aguas, when opening hours extend past dusk to 10 PM; and Mirador Del Rio, the Gateway to Atlantis.